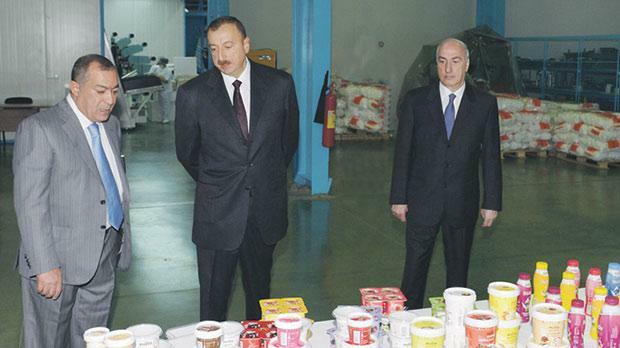 President Aliyev (centre) tours one of Mr Khangah’s Baku factories. An Azeri billionaire described by the US State Department as a very close “collaborator” of Azeri President Ilham Aliyev set up various companies in Malta soon after Joseph Muscat visited the country, The Sunday Times of Malta has learnt. On December 23, 2014, Manuchehr Ahadpir Khangah registered Mulsanne Investments Ltd together with BTI Management Limited, a company owned by Nexia BT. The new company shared the same registered office as Nexia BT in San Gwann. The Azeri businessman set up the company just a week after Dr Muscat’s unannounced visit to Azerbaijan, during which the government signed an oil and gas cooperation agreement. Dr Muscat travelled with his chief of staff, Keith Schembri, and Energy Minister Konrad Mizzi. However, no government officials or members of the media accompanied the delegation. The following month, Mr Khangah set up six more holding companies in Malta, all named after famous composers – Mozart to Vivaldi to Puccini. Mr Khan-gah’s company, Mulsanne Investments, held all the shares in the new companies except for one share which was held by a subsidiary of Nexia BT. Though the companies are relatively new in Malta, some of them just over one year old, all Mr Khangah’s companies have been put into liquidation. It is not known why they were set up and what trading, if any, was done. Efforts to reach Nexia BT about the sudden liquidation of Mr Khan-gah’s companies proved futile. Nexia BT is the same financial management consultancy used by Dr Mizzi and Mr Schembri to open trusts in New Zealand and related trading companies in Panama – which has been at the centre of a political controversy. Last week, Dr Mizzi revealed that it was Mr Schembri who suggested to him the overseas financial set-up. He said that he then spoke to Mr Schembri’s financial advisers. Nexia BT are also Mr Schembri’s auditors of his private business – Kasco group. Mr Khangah is considered one of the wealthiest businessmen in Azerbaijan, with direct access to Mr Aliyev. Leaked WikiLeaks cable reports drawn up by the US State Department describe Mr Khangah, who also holds an Iranian passport, as “the CEO or ‘frontman’ of a substantial portion of the Heydarov family conglomerate”. According to the leaked report, the Heydarov conglomerate, which owns a business empire ranging from the production of fruit juices to real estate development, is the property of the family of Minister for Emergency Situations Kamaladdin Heydarov. The State Department cable described Mr Heydarov as the most powerful minister in the Aliyev government. He “controls more visible assets and wealth within the country than President Aliyev”. Azerbaijan is considered by Transparency International as one of the most corrupt countries in the world.